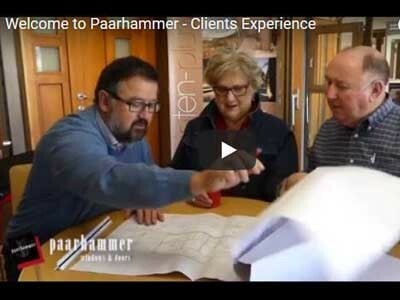 The journey with Paarhammer often begins with a showroom visit for a meet-and-greet to see the products first hand, operate the German hardware, and take a tour of the factory to see production in action. With a variety of ranges, timbers, finishes and glass to choose from, a visit in person to our factory or a visit to our stand at the latest home expo can help with the final selection. Discussing the scope of work over a coffee is a great way to get to know our clients’ window needs, understand the objectives of their individual project, and to answer any questions they may have. Once the requirements for the project are finalised, a quote is prepared, and works proceed when the quote is accepted. The order then begins the manufacturing process in our factory, and our team bands together to make the windows and doors we are renowned for. All Paarhammer products are made to order. It is just as exciting for Paarhammer as it is for the client when their windows and doors leave the factory and are installed into their masterpiece or ‘grand design’. We look forward to taking this journey with you.